ORLANDO, Fla. - No dramatic weather going on with lots of opportunity to enjoy the outdoors currently and no big changes coming our way. A foggy beginning this morning and the potential for another one tonight and tomorrow. Best chances are around sunrise is low areas and fog pockets. Additionally, a weak frontal boundary is sinking South over us and bringing lots of cloud cover for tonight and Monday. This will interfere with seeing the supermoon that will be at its closest point to the earth at 6:22 am on Monday. This is the closest since 1948. 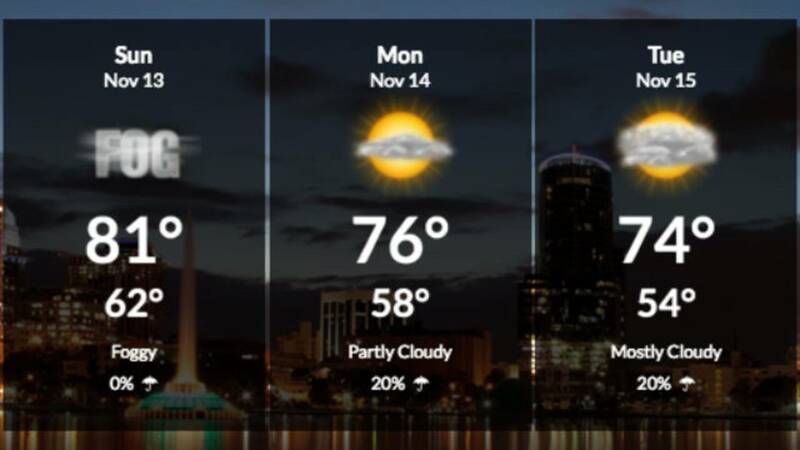 Expect Monday to be on the cloudy side with temperatures topping out around 77 degrees. The weak frontal system will move to the south, clearing skies and allowing temperatures to drop 59 in Orlando and 47 in Ocala Monday night. The remainder of the week looks sunny and dry with normal 70's daytime and 50's nighttime. The remainder of the week looks dry. In the tropics, all is quiet but we are watching an area around Central America that poses no threat to Florida. Try to get a glimpse of the supermoon. The next one happens in 2034.